After several have approached me both on and offline about it, I’ve decided to make a page that lays out my experiment and how you can do it to. And once again, PLEASE keep close track of your data and share your results, whatever they are. The more people who do this, the more data we have. 2) I can’t find an NMR cholesterol test in Belgium (the country). I found Belgium,WI as an existing city :). Do you have any knowledge of a lab in Belgium doing these? 3) Unable to send private twitter messages, did you block that on purpose or am I doing something wrong? 1- Fantastic, Ferro, glad to hear it. I look forward to your data. 2- I’m not as familiar with labs outside the US, you may need to do some google investigating. 3- I’m actually kind of new to Twitter, but I believe you can only private message someone when both of you are following each other. What is your Twitter handle? 1) You mention that you and the others that did the test allready are on an LC diet. So I was thinking to start with 2 weeks of “normal” LC. Because the end of year I’m cheating a lot. Anyway, why didn’t you do a baseline bloodtest before the experiment? I will do one before the start of the test, and If I start with 2 weeks of “normal” LC, I will do a test before starting that too. 2) still googlin. hsCRP can be done I our lab. 3 – I messaged you on Twitter. How important is it to do the whole 3 days of high fat/high calorie intake before the blood test? I attempted this test but could only stomach the first 2 days of the high fat/high caloric diet & the results were not an ‘improvement’ test result-wise. Is one normal diet day & a 14 hr fast the next day before the test enough to turn that LDL-C & LDL-P completely around? I expected a sizable reduction in LDL since I did 2 of 3 days (like 2/3 of a reduction in LDL). btw for almost 3 yrs now, my LDL-P numbers have been >2000 since switching to a (mostly) keto diet. It’s been off the charts (>3500) for ~ 1 year now. All the other numbers on the NMR look spectacular except for the LDL particle number. 1 – Before you did this test you’re referring to, when was the last one before that? Let me first mention that this is such amazing work. I’m in the same boat where my LDL-C (upto 700) + LDL-P (>3500) shot up on a keto-genic diet (despite feeling and functioning great). I tried lot of things like a.) adding probiotics, b.) adding upto 50-80gms carbs, c.) and off and on tried statin + ezitembe too. Only thing that worked were medications. 1. You did manage to drop your LDL ingesting high amounts of fat but obviously most days your fat intake will be lower. This means, for the most part you will have a high LDL-P count. Personally, are you comfortable with a high LDL-P on a keto-genic diet? 2. You seem to have gotten a 1000 pt drop in LDL-P. If we assume this scales linearly, for this to work with my numbers i probably would to ingest an obscene amount of fat! If you think you can give me few good pointers i would love for you to have a quick look at my NMRs + other blood markers (over email or phone). I too have had quite a few over the last few years, and nothing excites me more than getting that extra data point of information (or blood test). Also, let me know if you plan to start some kind of forum/group/face-book page where we could share our readings/experiments etc. – 1 – Yes, I dropped my LDL-P substantially in order to prove the inversion pattern I identify with my research and how the lipid system is very different from the way the literature and current lipidology describes/understands it. This was *not* done as a form of treatment for my high LDL-C/P, nor am I recommending it as such. Yes, I’d say I’m “mostly comfortable” with my high LDL-C/P numbers. I often put it like this, when I found out about my numbers I was concerned at a 9 on a 10 scale, and now I’m more like a 5… but not a 0. The reason is that I now understand (and my data is likewise backing up) that triglycerides and cholesterol are intimately linked given they “ride share” in the same lipoproteins. And while this is basic biochemistry, it is weirdly not well understood that if you are increasing your dietary fat and lowering your carbs you must likewise be increasing trigs heading to your cells — which either get there in LDL particles or as ketone bodies, but mostly the former. Thus, whatever your LDL-C/P tests on keto, you WILL “traffic” more trigs and therefore circulate more cholesterol as it comes standard in the same LDL-Ps. – Yes, per your idea of the Facebook group, I’m actually working on a kind of “Super N” experiment group that I’ll have more details on in the coming months that’s very similar to what you’re describing. Dave – I am interested in trying out this experiment on myself, and was wondering if you could give an example menu of what you ate on your High Days. I currently eat following macros I calculated on Ketogains (protein at 165g +/- 20g, NET carbs less than 25g, and fat g to ensure satiety…….about 90g/day). I am 6′ tall and weigh 178lbs (pretty consistent at that weight for last 4 weeks or so). When I look at your fat consumption on High Days I am blown away, and feel like I would struggle mightily to own that many calories. I was hoping to se what you consumed so that I could gauge my likely success on following something similar. Thanks in advance for your time AND for this awesome work you are doing! I just finished watching your interview with Luis on Ketogains. I found it encouraging for my own situation. Since April 2016 I have lost 69 pounds following Ketogains macros and have reached my goal weight of 145 pounds. (Female 5’4”, 55 years-old). Feeling energized, fit and fantastic I visited my family doctor for an annual checkup. Everything looked great: good BMI, BP 122/77. Most of my bloodwork was also good: A1C 5.3, HDL 52, TG 96. And then the dreaded high LDL of 247. Predictably, my doctor was alarmed and suggested familial hypercholesterolemia (it seems unlikely as I have no history of heart disease in my family and both my parents are 80 years-old). She is in favour of lowering carbs, but proceeded to hand me a fact sheet on lowering fat consumption by switching butter out for margarine, and choosing lean meats :(. After watching your video I went and checked my own spreadsheet where I have religiously tracked my daily macros since April. Sure enough, for 4 days prior to my bloodwork I had purposefully lowered both my calorie and fat intake in preparation for the test. In fact, I had fasted completely from food for 22 hours preceding the test. I have more bloodwork scheduled for March and I will prepare differently this time by substantially increasing my fat intake for a few days prior to the test. I don’t have anything to lose as I will not take statins at this point no matter what the LDL results are. I’ll let you know the results. Your *triglycerides* are 12.3 mmol/L? That is definitely something I would want to address, as soon as I could if I were in your shoes. What did your diet look like before the test? I started on a ketogenic diet early May of this year, that was the first draw and it was 12.9, then on Monday it was 12.3. Essentially on straight keto, Fats, greens, macadamia nuts and of course proteins. Maybe some carbs once or twice a week in the form of maybe a slice of pizza, fleshy fruits like peach etc. Before keto, my TG was 6. However, my A1C did drop from 7.6 to 6.2 from May to August. Before keto, was on a lower carb diet but I still had fruits like apples, grapes and such. It could be that the higher fat of keto plus occasional carbs may be creating an unsavory mix that’s resulting in poor trig results. Carb leaks or higher carb plus higher fat is one of the possibilities that may result in higher trigs… To catch any other suspects you may want to look at this list and troubleshoot to see what it is that’s causing such high triglycerides. I’m confused. After I do the cholesterol drop with success, then what? Am I supposed to continue to eat 5000 calories a day? It’s more of a way to demonstrate that LDL is heavily influenced by dietary patterns (specifically fat intake, and energy source e.g. fat vs glucose), and easily manipulated – meaning that it may be heavily context dependent (as high cholesterol could be caused by other factors like underlying illness, or chronic conditions) as far as risk goes. To see why that’s especially relevant in low carbers you could check here. 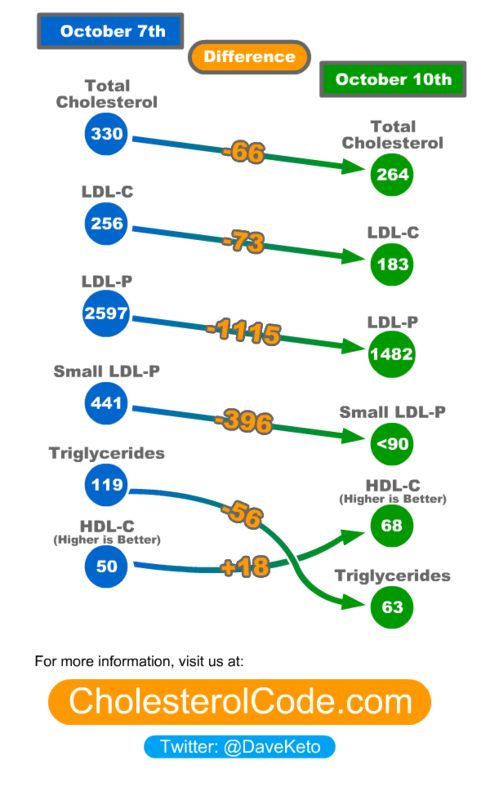 Here’s where I’m stuck: chronically higher fat => more Trigs in transit => higher LDL needed (LMH story). So why does a sudden increase in Fat (Trigs) *reduce* the number of carriers ? (according to this theory) Is it is because more of these “carriers” shifted into the VLDL stage, which has a 2-3 day lifetime? (In which case the “drop” will reverse once bolus of trigs clears ?) If so, seems to assume/indicate a maximum to the lipoprotein creation rate – which you can overwhelm in the short term. I think Dave speculates on this in an earlier answer 4257 “There’s just a few of us that think the same thing as I do. That cholesterol is the red herring. That mostly, this is due to higher demand for fat-based energy coming from storage in the form of triglycerides being carried by VLDLs. The cholesterol being measured resides in those VLDL-originating LDL particles, which is why it’s quantity is inverted from the total amount of dietary fat I eat. I thought VLDL carried trigs from all sources (diet and storage) so increasing dietary fat would also increase the need for VLDL carriers. Hi Bruce — generally, the vast majority of VLDL triglycerides are from fatty acids liberated from body fat (adipose) and not from fatty acids you’ve just consumed (which are carried on board Chylomicrons). I would like to understand what is the purpose of the 12-14 hour fast before the blood test. I had plan my 3 days high fat intake perfectly with 6000+ of high fat days and I am now on day 4 but started the day thinking I was on day 3… typical me… So now I just had a 2000 calories breakfast and going to do my blood work shortly… I guess I will find out what the purpose of fasting is, but still would like to get DF scientific explanation. Going in without fasting properly can result in inaccurate results including higher than normal triglycerides, remnants, insulin, glucose, and possibly LDL. Going in fasted too long can result in higher than normal LDL, higher trigs, lower HDL and some others. You get data capturing you trafficking fat you just ate, and it might interfere with the results of the protocol.